Follow the Money: Skinner’s Coins & Currency Auction Tenders a Wide Selection of Desirable, Affordable Examples of Numismatic Interest | Skinner Inc. 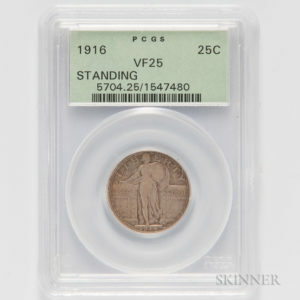 Coins are the most widely collected forms of currency and represent the largest number of lots in this online-only auction. Numerous examples of paper currency, tokens, medals and stamps are also included. Over 1,000 lots are being offered, spanning many centuries and a great diversity of countries and cultures. The auction opens on Thursday, August 17 at 10AM and begins closing on Friday, August 25 at 2PM. As with all categories of antiques and collectibles, coins and other types of currency appeal to collectors for many reasons: rarity, age, historic significance, artistic merit, personal associations, and investment potential. Good examples of all of these criteria are represented in this auction. An outstanding opportunity is offered with numerous lots of 1997 25 yuan and 50 yuan gold panda coins. This is an especially desirable year for these widely collected coins from the People’s Republic of China because of the small total mintage of each denomination: 21,909 for the 25 yuan and 15,483 for the 50. ♦ 1997 25 Yuan Gold Panda (Lot 1586, Estimated between $300-500). Sixty-two examples of this denomination and year are offered. ♦ 1997 50 Yuan Large Date Gold Panda, ICG MS69 (Lot 1615, $500-700). Sixty-one examples of this denomination and year are offered. 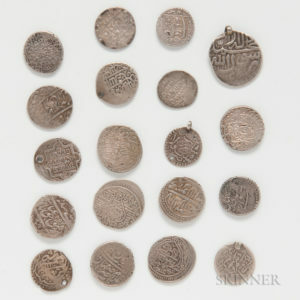 Lot 1774 presents additional intriguing gold coins, these from a different era and half way around the globe. This lot is comprised of forty German 20 Mark Gold Coins, dated between 1872 and 1913 ($10,000-14,000). Other auction highlights include examples of American currency that are notable for rarity, beauty, or historical interest; some combine all three qualities. ♦ A 1916 standing Liberty quarter. This was the first year of mintage for this coin, with a total mintage of 52,000, one of the lowest for all 20th century coins. One of the most collected series in the denomination, the renowned design was by Hermon MacNeil, whose sculpture of Justice adorns the pediment of the Supreme Court. (Lot 1138, PCGS VF25, $5,000-7,000). ♦ An 1843 Republic of Texas 12 ½ cent “Exchequer” note. Johnson notes that this note is a real rarity, with only a dozen or so known to exist. This example of the Republic of Texas’s last paper currency before being annexed by the United States is in very good condition. (Lot 1915, PCGS Very Fine 25, $6,000-8,000). Popular categories of American coins, from Indian Head cents to Liberty head nickels to Morgan dollars, are well represented, including sets, mixed lots and groups that provide ample material for collectors who want to broaden their collections or swap with other numismatic enthusiasts. The auction includes a number of intriguing items beyond coins and paper notes. Kyle Johnson mentions a white metal Washington funeral medal, distributed at George Washington’s second funeral procession in Boston in 1800 (Lot 1894, $1,000-2,000). Another piece of American history is an 1897 General Society of Mayflower Descendants Commemorative Badge in 14k gold, with original embossed box (Lot 1893, $400-600). Lots 2025 to 2041 include stamps from all corners of the globe, including first-day covers, postcards, and an album of Italian and Italian colonies’ stamps. This auction offers collectors at every level an opportunity to acquire history in miniature in an online-only sale format that is convenient and leisurely. Preview for this auction will be held at Skinner’s Marlborough Gallery on Wednesday, August 22, 12 to 5PM and Thursday, August 23, 12 to 8PM. Skinner auctions draw international interest from buyers and consignors alike, with material regularly achieving record prices. The company’s auction and appraisal services focus on fine art, jewelry, furniture, and decorative arts from around the globe, as well as wine, fine musical instruments, rare books, Asian art, clocks, Judaica, and more. Monthly Skinner Discovery auctions feature a breadth of estate material. Widely regarded as one of the most trusted names in the business, Skinner appraisers have appeared on the PBS-TV series, Antiques Roadshow, since the show’s inception. Skinner has galleries in Boston and Marlborough, Massachusetts, as well as in New York City and Miami, Florida, with bidders participating in person, by phone, and online. Join auctions live with SkinnerLive! and Bidsquare. For more information, visit www.skinnerinc.com, find us on Facebook, or follow us on Twitter and Instagram. 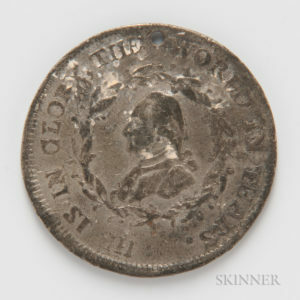 This entry was posted in News and tagged banknote, banknotes, bill, circulated coins, coin, coin collecting, coins, collectibles, colonial coins, currency, gold, gold coins, history, money, numismatics, numismatist, old coins, paper money, rare coin, rare coins by Skinner. Bookmark the permalink.